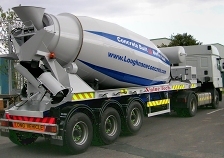 Articulated Transit Mixers | Concrete Mixers | Transit Mixers - Value Tech Ltd.
Value Tech cooperate with Liebherr to produce a range of Articulated Transit Mixers varying in size and specification to comply with specific UK and Ireland transport regulations. 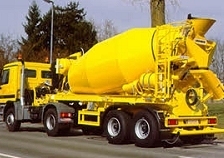 Popular versions produced include a HTM 1004 (10 - 11 cubic meter) and HTM 1204 (12 - 13 cubic meter) Liebherr mixing drum factory built by Liebherr on a special sub-frame superstructure assembly. This unit is then equipped by Value Tech with customer specified running gear and specification. The HTM 1004 version is usually built on a 3 axel sliding chassis, whilst the HTM 1204 is built on a Heavy Duty Fixed Frame Chassis with front and rear lift axles.